You may know us as Old California Lantern or as our parent company Contract Illumination. For over 23 years we have been manufacturing custom lighting for all types of projects. Our experience ranges from Commercial to Residential, from Churches to Hotels and all types of Restaurants. Since our beginning in 1989 we’ve built a reputation for exceptional quality and precise project management to provide our customers with “on time” and “on budget” projects. We hope you enjoy your visit to our website and we encourage you to contact us about your next custom lighting project. Beginning in 1971 as a college student working at a local lighting company, Tom Richard had no idea this accidental job would become a lifelong career. A career that now spans over 41 years and has covered most areas of lighting from residential to commercial and now includes extensive experience in the custom lighting arena. Tom’s first exposure to the custom-contract lighting market was from 1985 to 1987 as Vice President of Contract Sales at Forecast Lighting, Inglewood, CA. 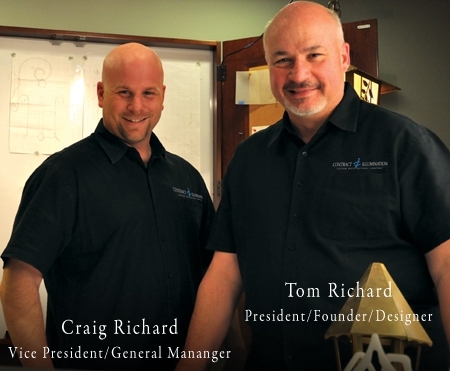 Forecast, a national company and a true manufacturer, wanted to expand its residential lighting brand into the custom lighting market and this new direction became a perfect opportunity for Tom’s already extensive lighting experience. The experience at Forecast became Tom’s inspiration to create Contract Illumination. In September of 1989, Contract Illumination was born with the assistance and guidance from Ben Sclafani, one of the original owners of Forecast Lighting, Tom would often refer to Ben as not only his mentor but his guardian angel during those early days of launching Contract illumination. With two national accounts, “Supercuts” and “Jack in the Box” Contract Illumination was off and running. Contract Illumination’s early days of chain restaurant business quickly grew into a custom lighting company with projects covering all areas of the custom lighting market. In 1994 son Craig Richard joined the management team and with his primary focus on manufacturing he soon began a long term investment program in the company’s manufacturing capabilities. Under Craig’s guidance Contract Illumination’s manufacturing capabilities have expanded greatly. Currently, Contract Illumination operates out of a12,000 square foot factory in Orange, CA. Over these past 18 years the company added a water jet machine, CNC Mill, and numerous metal fabrication and welding machines. Also added during these years was an expanded chemical patina finishing department complementing their already existing powder coat finishing department. To better serve their customers from a design standpoint, “Solid Works” 3-D design software and a 3-D plotter for rapid prototyping were added, both allowing their customers to see their custom lighting fixtures in intimate detail long before the fixture is ever constructed. Since those initial days over 23 years ago, Contract Illumination’s project history has grown from two national accounts to a long list of projects nationwide. From the Lodge at Torrey Pines in California to the Greenbrier Resort in West Virginia to the Grove Park Inn in North Carolina, Contract Illuminations experience in custom lighting is extensive and prestigious. They look forward to the next 23 years in business and the possible addition of a third generation of the Richard family in the lighting business.